Major indices were mixed yesterday as late-day buying helped to save some, but not all, indices from seeing losses on the day. Some indices like the large-cap Dow (DIA) and tech-heavy Nasdaq (QQQ) came up short putting them further into the red over the past five days. Whereas one week ago every one of the major index ETFs sat in overbought territory, only four are neutral while the other ten are overbought. 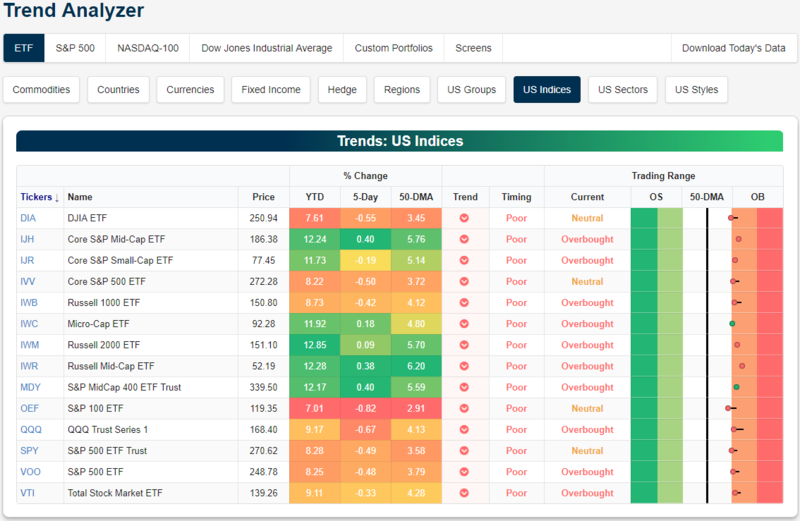 Those ETFs that are neutral are comprised of the large caps: the Dow (DIA) and S&P 100 (OEF) as well as the S&P 500 indices (SPY and IVV). Also over the past week, the small and mid-caps are the only indices to edge out gains. These are also the indices that have outperformed year to date. Recent price action has begun to show a more drastic divergence between these small and mid-caps and the rest of their peers. For example, the Russell 2000 (IWM) has been the best index so far this year up 12.85%; other similar ETFs are not far behind in performance. Meanwhile, the large-cap S&P 100 (OEF), though it hasn’t seen a loss, is only up just over 7%.